PreSonus has just revealed the Quantum 2 Thunderbolt audio interface. Smaller than the original, it delivers on the same promise of its big brother: near zero latency. Quantum 2 from PreSonus isn’t just another audio interface: this Thunderbolt beast promises direct to DAW recording and monitoring with near zero latency. The Quantum’s other specs are equally impressive. It offers up to 24bit/192k conversion, with 120db of dynamic range. 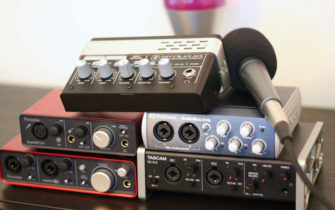 And though its a desktop size unit, connectivity is plentiful with two combi mic/instrument inputs on the front, two combi mic/line instruments on the back (plus digital expansion), and TRS outputs for monitors and headphones. What sets the Quantum 2 apart though is its speed. This allows for a direct to DAW workflow – so rather than having a separate piece of software to handle real-time monitoring, or effects integration while recording, all these tasks can be handled in your DAW without latency distracting from the performance. Sweet simplicity. For more info, visit PreSonus.